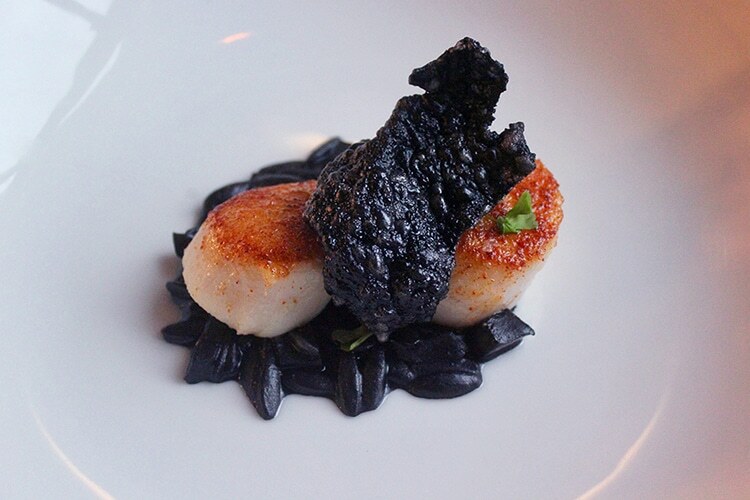 An other-worldly restaurant experience at etch. At home, in August, it can be easy to forget that you needn’t go far to discover another world. The goal of most top restaurateurs must surely be to become prince of a compact planet contained within a dining room: a carefully curated land of beauty and plenty. 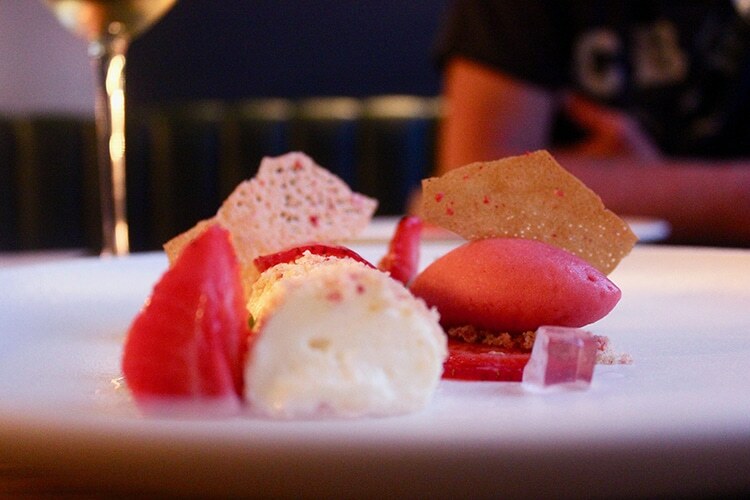 After all, a great restaurant experience takes diners on a journey through an imagined place. A simple principle that’s hard to achieve, and wonderful to behold at Steven Edwards’ etch. My ‘flight’ here takes place on a rainy Wednesday evening in the height of summer. I’ve driven up the A27 in hat and coat and now I’m shimmying up a sodden street as my husband cups a cigarette from the drizzle. The premises on Church Road glow beautifully this cold evening, exuding the same kind of inviting warmth that comes from a proper pub. We’re shown to a window booth, comfortable and private. All the tables seem to offer a good view of the bar and kitchen, both designed to communicate well with each other, and to us. It’s clear this environment is well planned. The team work calmly together and make time to share their knowledge in a precise, unpretentious way. The room contains all the pleasing details needed – a towering, well-stocked bar; crisp napkins; sparkling glassware – but with no overbearing pomp. Etch. 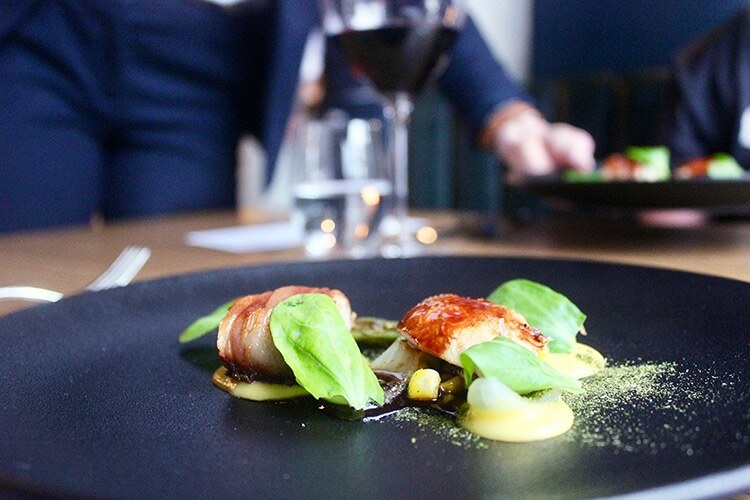 is the first restaurant by chef-proprietor Steven Edwards, the sixth winner of Masterchef the Professionals who has worked alongside Raymond Blanc, Chris Wheeler and Matt Gillan. Steven is a friendly, guiding presence. I watch him quality control the dishes and bring them to tables, taking time to introduce himself and his creations personally. His effort really elevates the experience and makes us feel at home. 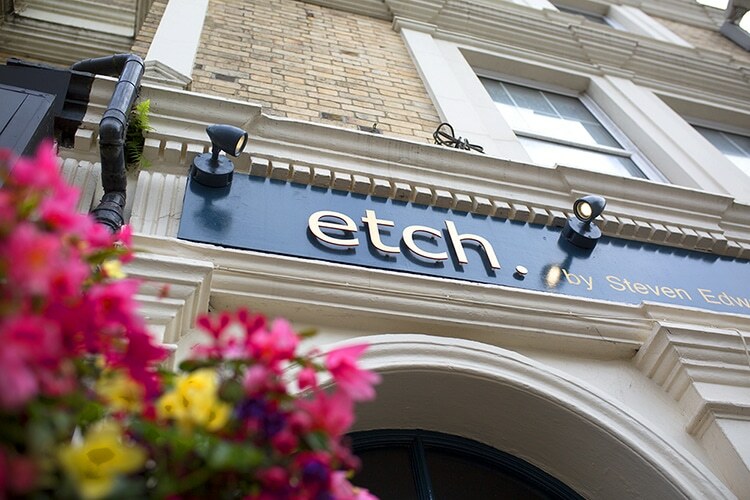 Fine dining is not for everyone: it can be self-conscious, and invite self-consciousness, but not at etch. Etch. 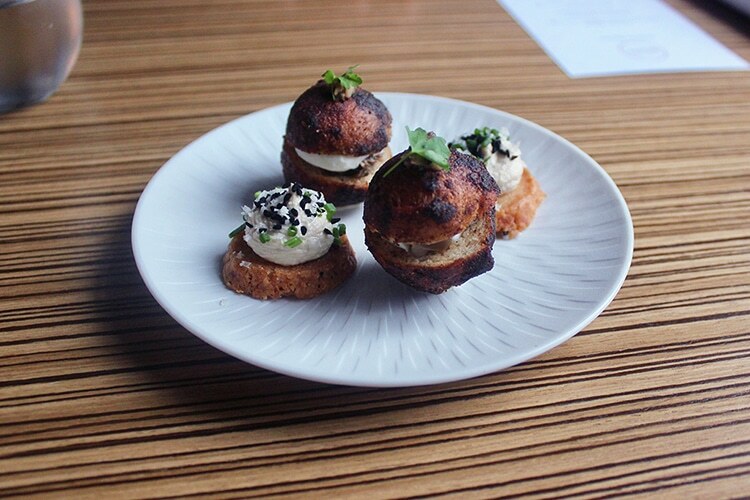 offers a range of tasting menus. 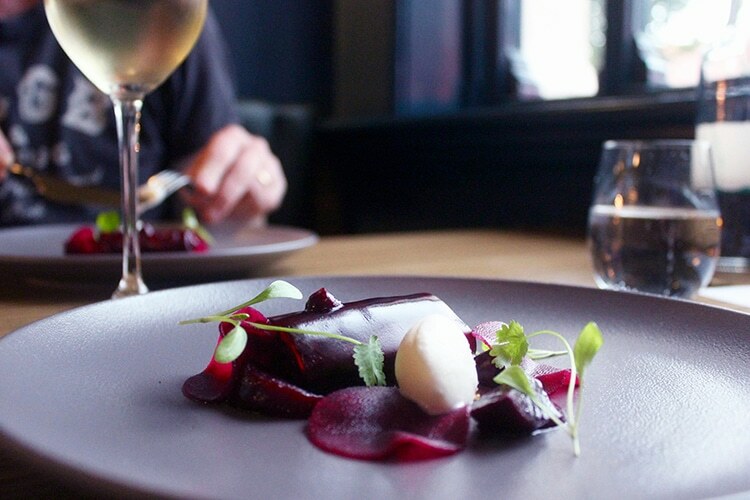 At lunchtime and on evenings mid-week it is possible to have a lighter four or six-courses but we are treated to the full eight-course feast matched with wines from around the world. These days it’s almost compulsory for restaurants to disclose the provenance of their ingredients and etch. holds no exception. They give heads up to MCB Seafood, Beals Farm Charcuterie, Barfields Butchers, Tastables and The Cheeseman on the menu and staff reference others as they introduce each dish. 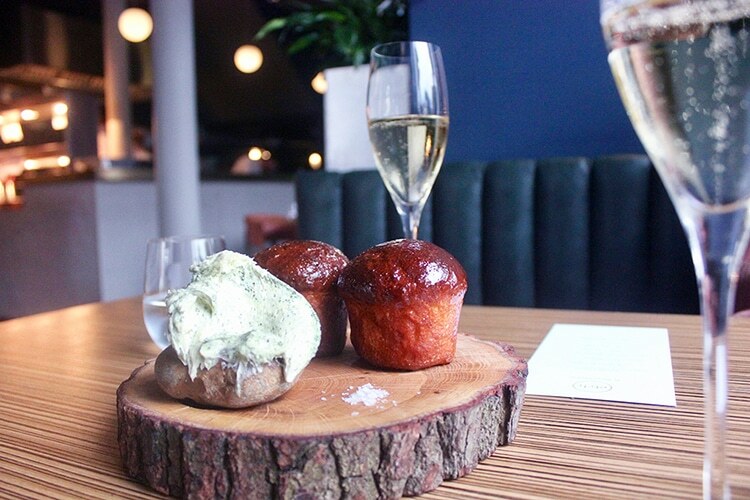 Our first plate – two powerful snacks in the shape of a miniature mushroom doughnut and an intensely cheese-y biscuit – are accompanied by bubbly glasses of Nyetimber Classic Cuvee. 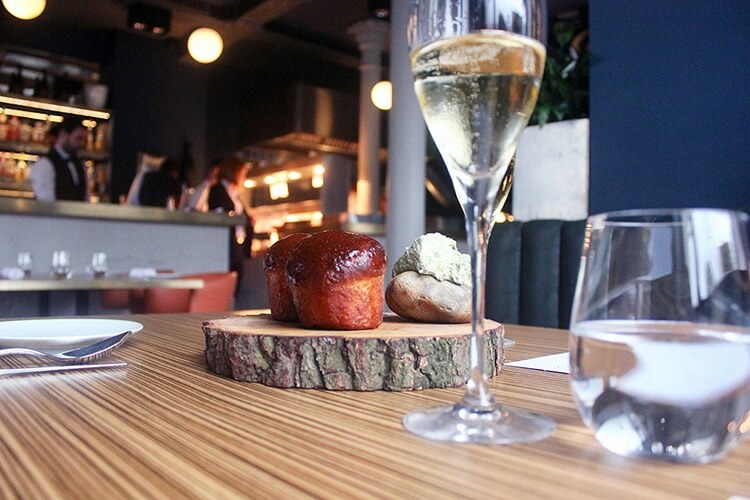 Then comes the bread, which on alone is worth fighting over: beautifully-raised balls of ‘Marmite brioche’ that bounce and flake lightly as I spread on a slick of salty seaweed butter. 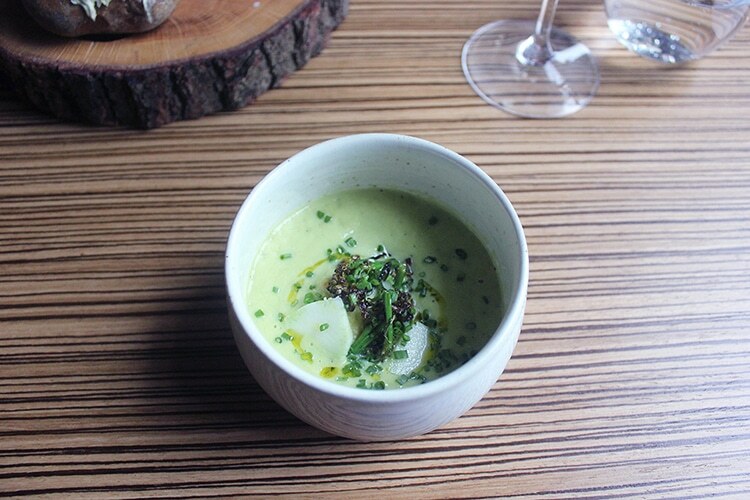 The soup, says the menu, is ‘broccoli | cheese’, and paired with a grassy Loire Valley Pouilly Fumé that complements the Golden Cross bon bon hidden inside the bowl. 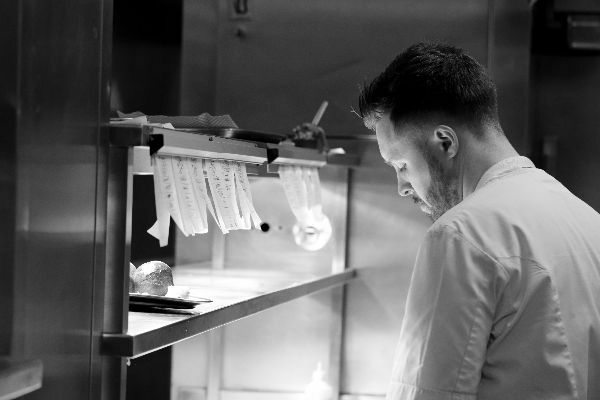 Steven’s food is down-to-earth, considered, each ingredient is allowed to shine in combination with a sensible other that brings out its best qualities. The method behind each is exacting, and the thinking controlled yet accessible, leaving little room to divide opinion. My favourite comes next: a new arrival celebrating local mackerel, greengage – a seldom seen but harmonious partner – and peppery watercress, matched with an unusual Italian Gavi. 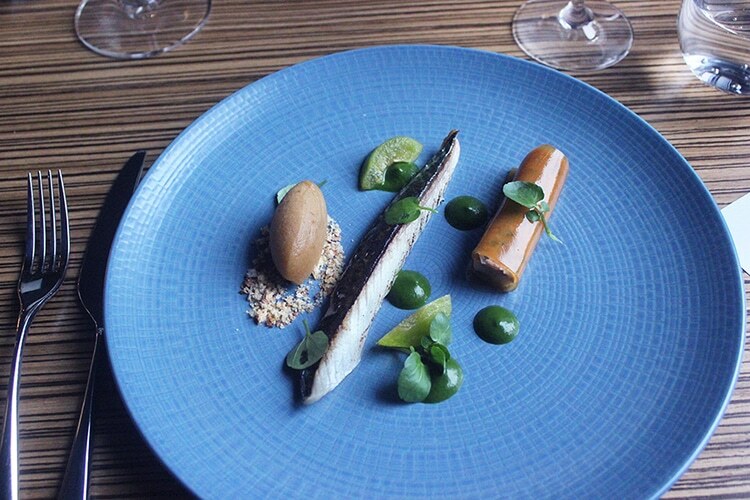 The 50/50 salt sugar cured fish has a gentle smokiness and clean texture that, in combination with a surprising touch of greengage sorbet, is magical. The flavour, a mid-point between apple and gooseberry, is pleasingly fresh. Next up, quail and corn. 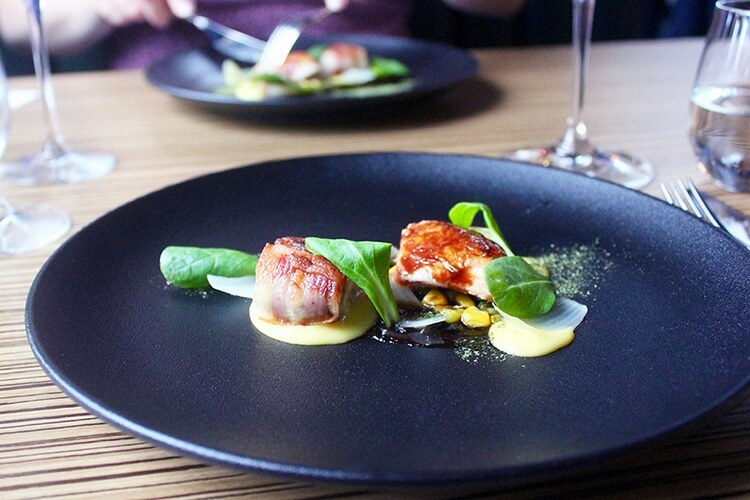 Another friendly dish featuring a ballotine wrapped in wafer thin bacon that dissolves on the palate like a Frazzle, served with hay-smoked sweetcorn, pickled onion and a lightly-oaked Fleurie. Then, beetroot tartar with caper berries and shallot wrapped in a shiny shell of deep purple jelly matched with spiky horseradish and fragrant coriander leaf. Braised cuttlefish – my nemesis one holiday – this time, though, an umami base in which to steep delicate orzo pasta served with sweet, caramelised Orkney scallops. I return my plate clean, in a state not unlike an intaglio etching. The final savoury dish is ‘pig | broad bean’. 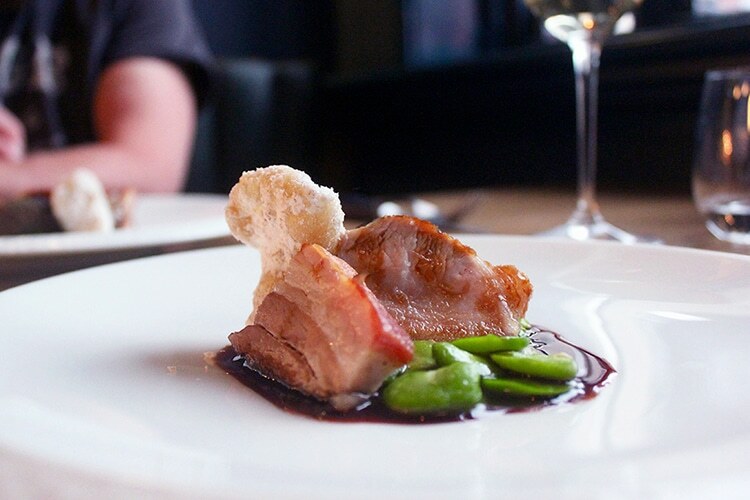 Tender 24-hour pork belly served with a ball of deeply flavoursome pulled pork in black pudding crumb; incredible crackling worked to a texture not unlike a rice cracker and well-seasoned greens. This, served with an irresistible berry and cherry flavoured Chianti. At this point we’re served pre-dessert, the mere concept of which makes me smile, as if I might find ‘just dessert’ insufficient. 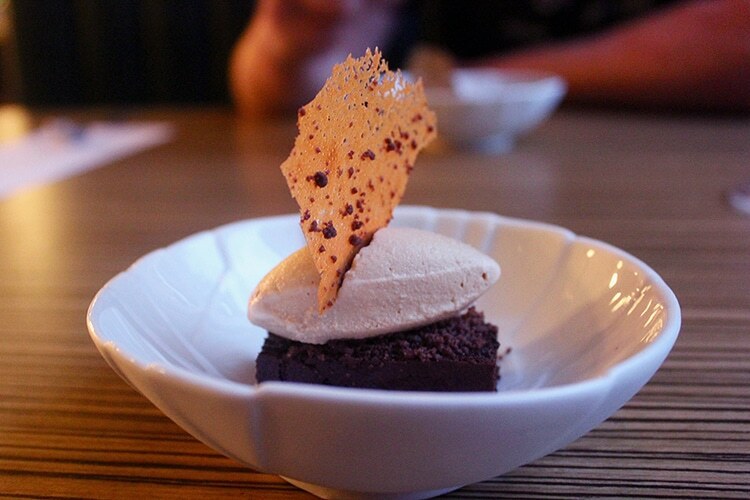 A tidy square of chocolate layer cake with Earl Grey ice cream and a crisp wafer to eat as the last light dims the window. The journey has taken nearly three hours, and we’re still to consume our deconstructed strawberry cheesecake with Greek basil – a justly weighted dessert, refreshing enough to finish this rainbow of a meal. 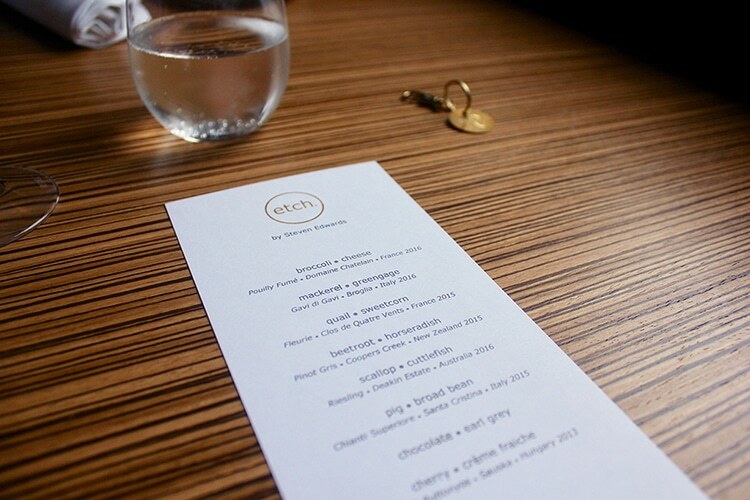 And so completes our evening at etch. the dining room still buzzing as we leave, more guests enjoying a drink as they wait for our table. The restaurant has been heavily booked since it opened in March, and if they continue at this level, I see no reason this should slow. 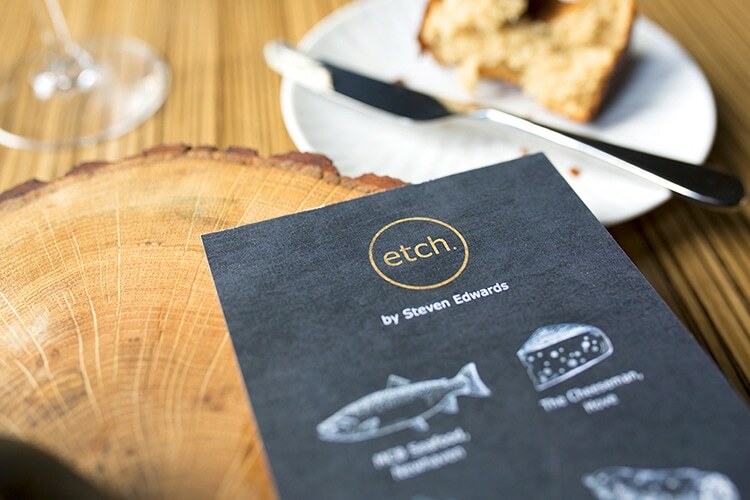 Take a look at the feature page for etch.